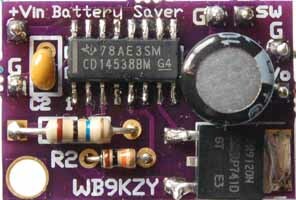 Press the add-to-cart button to purchase the Battery Saver kit using Paypal. got a project that eats 9V batteries ? Printed manuals available for an additional charge or save money by downloading (Right click/save target as) and printing the manual , schematic and hookup diagram . The Acrobat files of complex diagrams (like the Battery Saver schematic) may not view well on your computer screen - suggestion: use the magnifier to zoom in for better detail or print out the file.